Roscoff, Mont St. Michel, St. Malo and Pete – 5-6/4/12 | Camperissimo! Jako ste ovo lijepo opisali, zao mi je samo da niste slikali gospodina doktora. 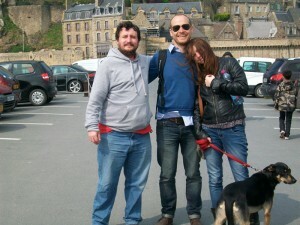 I wonder if your remember the time when the family visitted Mont St. Michel? of creating the largest sundial in the world. While we were there helpers had lined up markers on the beach. Hi Iva and Jay, just entered your blog to remember the mid-seventies, when I was there in my 2CV. Everything must have changed a lot since then. Wish you good luck for the continuation of the trip. Here in Munich it is virtually winter, yesterday morning there was snow on the roofs and trees!! P.S. Let me know, what the Camper might cost? In the midst of the excitement of planning this year’s tour of La France, my friend from university Pete suggested that he nip across on the cross-channel ferry from Plymouth to Roscoff to meet up with us for a day. Great idea, we replied, despite us having no idea where Roscoff was and Pete having no idea that he’d be spending 8 hours attempting to get just a little bit of sleep on the ferry floor. Our original plan included visiting Britanny (the top-left bit of France), but our appointment with Pete – who was arriving on the 5th April at 8:00am – meant a straight up 4 hour drive north-west from Saumur to Roscoff the night before so we could pick him up from the ferry terminal. 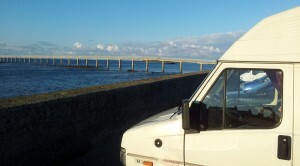 We arrived in Roscoff around 18:00 and Iva found a good place to park with a sea view, well off the main road through town. It’s odd, but since France is in the same timezone as Germany and Roscoff is so far west, the sun doesn’t set until 21:00, so we had time to walk around the town (pretty, creperies by the shedload) and along the front. It was quite moving for me to realise that the land mass I was looking across the channel at was England. After Klara had been walked and emptied we found a cosy restaurant in the town centre for what was one of our first meals out since we’d arrived in France. Iva ate something fishy and I ordered a pizza a lá Flammkuchen accompanied by a cheerful caraffe of local wine (I’ve now officially given up on ordering beer in France, since it costs a lot and tastes like piss). So far this month the weather has been kind to us, but most mornings we’ve woken up before dawn and put the heating on until breakfast. On the Loire it dropped to 4°c on a couple of mornings, but the heating in the van packs a serious punch (we already survived two nights in the Alps, mid-winter). That night our gas bottle ran out around 5am, and since one of the hinges on the back door of the van snapped and then snapped again*, changing the gas is a far from trivial endeavour. Chilly. *It’s just a 15cm piece of metal, but our stupid garage couldn’t find a replacement so they welded the broken one instead, a stroke of genius which held for precisely three days. Monkey-brained idiots. 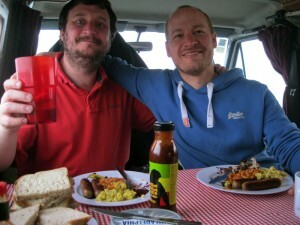 We picked Pete up at 8:00 and I cooked us a full on fry-up in the van before making a plan for the day to come. 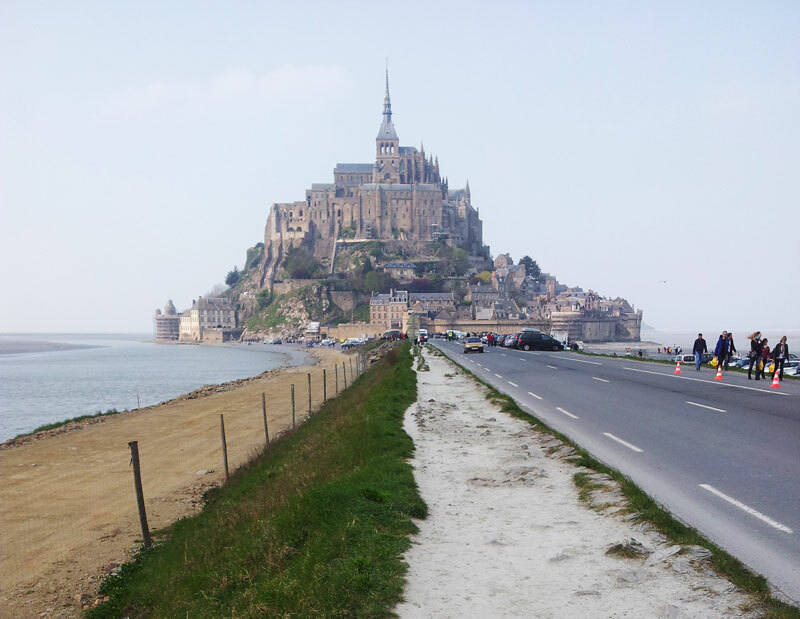 It was a toss-up between spending the day in Brest or the longer drive to Mont St. Michel, which is about 2,5 hours from Roscoff. Based on a pretty crappy weather forecast we had been leaning toward Brest, but the blue skies spurred us on and instead we drove east to Mont Saint Michel. Neither Pete nor Iva had been there before and both of them were very impressed. I had visited the mount about 20 years earlier on a family holiday, but even so it’s hard not to be taken aback again at the sheer size of it. I’ll leave out the details of the parking situation here, save to say that it was absolute and complete horror. Once we were inside the town we had a great time, walking all the way to the top, with amazing views and plenty of fluffy white Frenchy dogs for Klara to bark insanely at. We found a nice quite garden spot half way up for our little picnic and then hiked back to our parking spot, about 45 minutes away. 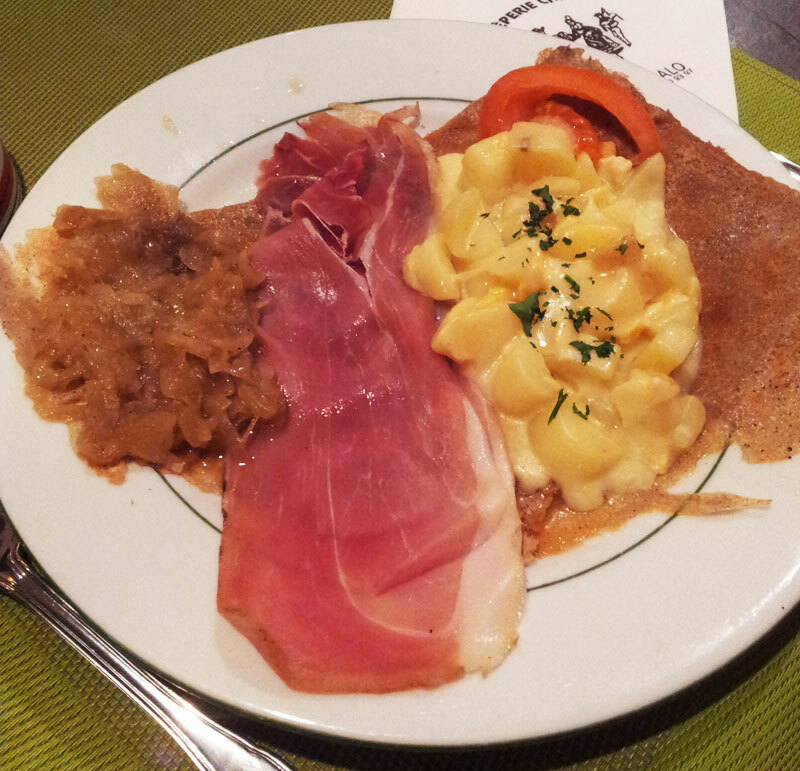 Somewhere underneath all of that is a galette! Before leaving Munich we’d thought about all three of us sleeping in the van, but after a week on the road to get used to the very limited space available within Camperissimo, we opted for a hotel instead. Iva set about checking what was available on booking.com as Pete filled me in on the latest gossip from the UK and I drove. This particular stage of the journey was especially challenging and enjoyable for me as the driver because half of the gears in the van suddenly stopped working (or rather the clutch as it turned out). By the time we arrived in St. Malo – where Iva had found rooms in quite a fancy hotel for half the normal price – I had truly understand the beauty and practicality of 1st gear, 2nd gear and reverse. Oh, how I miss thee. 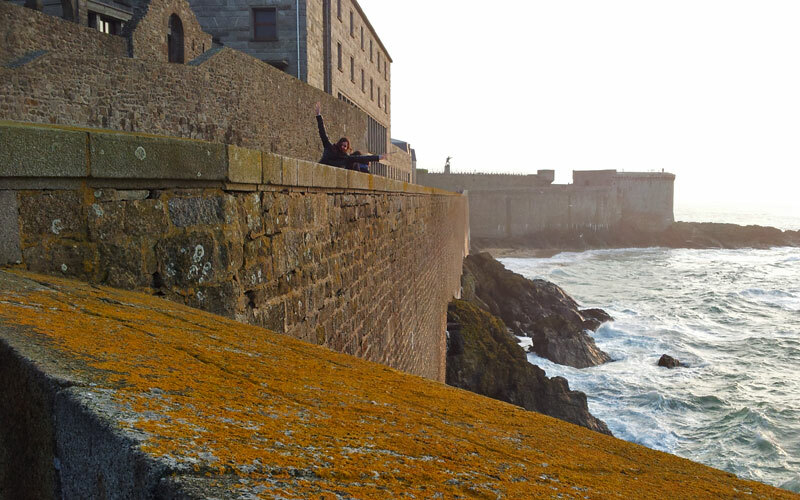 St. Malo was chosen as a convenient half-way stop on our journey, so our expectations were very measured. We were downright astonished to see intermuros, the walled old town, for the first time. Why had noone told us about this? Bastards! The last time I saw a completely walled old town on this scale was Dubrovnik, and St. Malo is truly no less impressive. We checked in at the hotel and then walked the walls of the town, before overeating on galettes and spending a week’s budget on 4 beers. All in all we had a great time with our first ever Camperissimo guest traveller. This entry was posted in Camper Trip April 2012, Uncategorized and tagged 2012, England, food, France, Mont St. Michel, Pete, Roscoff, St. Malo. Bookmark the permalink.